Delighted United manager Jose Mourinho walked out onto the pitch at the Allianz Stadium cupping his ears and winking towards the crowd after a win that gave his side seven points from four games -- two points behind leaders Juventus with two games to play in Group H.
It was the eighth goal this season for the 33-year-old who arrived from Real Madrid last summer in a deal estimated to cost 340 million euros in total over four years, on top of the 110 million-euro transfer fee. Massimiliano Allegri had urged his side to seal their first objective of the season of reaching the last 16, and a draw would have been enough for this. Ronaldo was backed up by Juan Cuadrado and Dybala, who scored the only goal in the reverse fixture at Old Trafford, up front with returning Khedira starting in midfield as World Cup winner Blaise Matuidi started on the bench. World Cup winner Paul Pogba, playing at his former club, was in midfield alongside Ander Herrera and Nemanja Matic. Ronaldo then served up Khedira but the German's low shot rattled the base of the post after 35 minutes. United were again saved by the crossbar after the break with a curling Dybala effort flying over De Gea only to clip the bar. 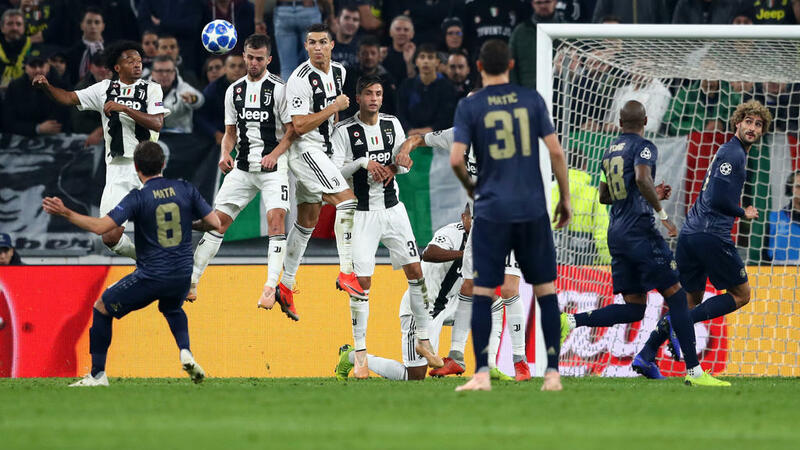 Juve were then left in shock as Ashley Young's free-kick in from the left bounced in off a combination of Bonucci and Sandro after a frantic scramble in front of goal, condemning them to their first defeat this season.